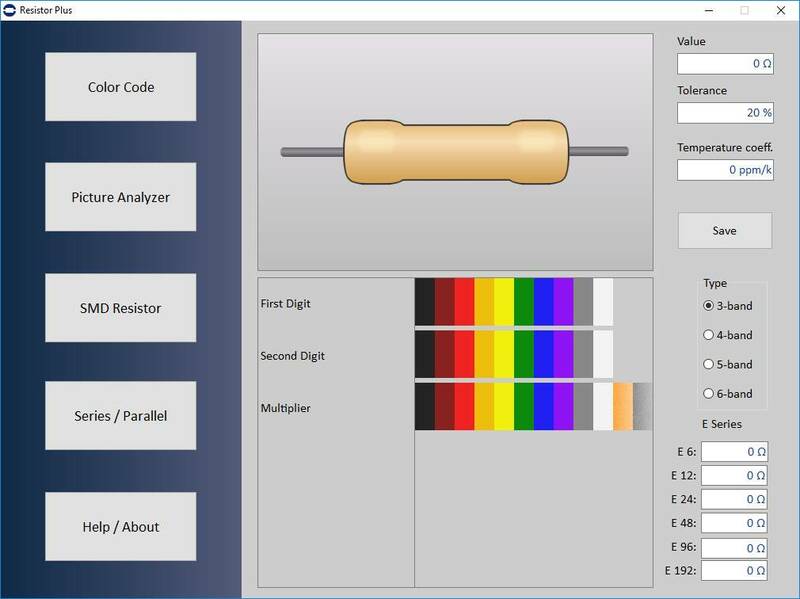 This software utility helps you find out the value of a resistor according to its color code, to generate the color code for a certain resistance value and to properly determine the colors you may found in a loaded image. It also deals with the codes written on SMD-type resistors in different standards and calculates the resultant value of two resistors connected in series or in parallel. There are separated pages dedicated for each of these operations, which may be selected by using the big buttons from the left side of the program window. First two pages are mouse operated, while the third and fourth pages may be controlled with either your mouse or your keyboard. A simple and ergonomic design, with larger fonts and big buttons, intuitive interface - are only a few of this program advantages. The program code was optimized for the newest versions of Windows. First page shows a 'blank' resistor, as in this picture, and you have to select the number of bands or the resistor in order to calculate its value. The horizontal color palettes correspond to each band, being in fact the color that encodes different digits, the multiplier, the tolerance or the temperature coefficient of the resistor. Once you click on that palettes, the bands will appear on the picture; when this process is completed, the data will be displayed on the upper-right fields. The closest values, corresponding to the different series (different tolerances) E6..E192, will be shown in the bottom-right fields. The image containing the resistor along with the colored bands may be saved (Save button) as jpeg or bitmap picture. The Second page allows you to load a picture (jpeg or bitmap formats) of the resistor (s) to find out the value for. When you move the mouse cursor over the picture, the color of the current pixel is decoded into its RGB components an displayed on the bottom-right corner. Select the number of band you see and then click on the closest colors from the horizontal palettes. When all band are selected, the data (value, tolerance, coefficient) will be displayed in the appropriate fields. Third page is dedicated to the SMD (Surface Mounted Device) resistors. The value calculator can decode both 3 and 4 digit codes, containing the letters R and M (R is the decimal point and M is used for milliohms values). Another commonly seen code is the three-character code EIA (Electronic Industries Alliance) system, called EIA-96. This system is used for SMD resistors with 1% tolerance and it uses some other letters to encode the multiplication factor, as in the next picture. A similar scheme, which starts with the multiplier letter, is used for the 2,5 and 10% tolerance type resistors. For example, A55 means a 330 ohm, 10% tolerance resistor. This resistor calculator may be also controlled by keyboard, and in this case Clear is the '.' (Del) key, Back is the Backspace key and Show is the Enter key. When the code is completed, the resistor picture may be saved in both jpeg and bitmap formats on your disk drive. If two resistors are connected in series or in parallel, the circuit's equivalent resistance may be simply calculated in the fourth page of the utility. Just enter the values and select the units of measurement, choose the type of the circuit and then press the Calculate button. The total value is computed with 5 digit precision, which is good enough for any resistor tolerance.